Paul's one-man follow-up to his legendary debut is even more experimental. Much like its predecessor, 1970's McCartney, signaled the end of the Beatles, its follow-up, 1980's McCartney II, came at the end of Wings. Whether Paul McCartney intended that to be the case is a matter of opinion, but he has not had a named band since nor has there been a third album in the McCartney series. 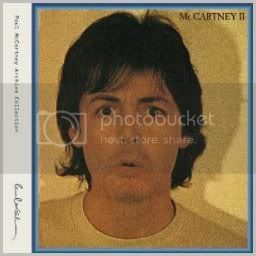 McCartney II was originally supposed to be a double album but ultimately got released as a single disc. 31 years later, the tracks intended for the double LP have been included as bonus cuts on McCartney II (Special Edition). The album leads off with one of McCartney’s pop gems, “Coming Up.” John Lennon, who was in the midst of writing songs that would become Double Fantasy, was reportedly very fond of it and it’s possible it renewed his competitive rivalry with his old partner. While the live version became a hit in the U.S., the studio version is tighter and packs more of a punch. Even the more straightforward tracks have an odd twist to them. “Bogey Music” could be a 1950s Elvis Presley rocker, save for the numerous multitracks McCartney did on his voice. It sounds as if 10 McCartneys are singing at once. More typical fare includes “One Of These Days,” a ballad that recalls his Beatles years and the gorgeous “Summer’s Day Song,” which shows McCartney had lost none of his gift for melody. Disc two includes a number of bonus tracks and listeners who feel the need can assemble these in their intended order to hear McCartney II as its creator originally envisioned it. The track listing is in cyberspace for those who look hard enough. Commercially speaking, one can hear why these songs were cut, but they are not without merit. “Blue Sway” – particularly the version with Richard Niles’ orchestration – is a trippy song that foreshadows his Fireman work more than a decade later while “Check My Machine” mixes a quirky, high-pitched McCartney vocal with a danceable groove. Also included is the aforementioned live version of “Coming Up” as well as the Christmas standard, “Wonderful Christmastime.” The latter’s B-side, “Rudolph The Red-Nosed Reggae,” is conspicuous in its absence. Like its predecessor, McCartney II was recorded at home and, as such, has a quirky feel to it. Where the original focused more on acoustic guitars, this one dove heavily into keyboards. While it will likely always be one of the more misunderstood records in his catalog, McCartney II (Special Edition) is still well worth owning for any McCartney fan.